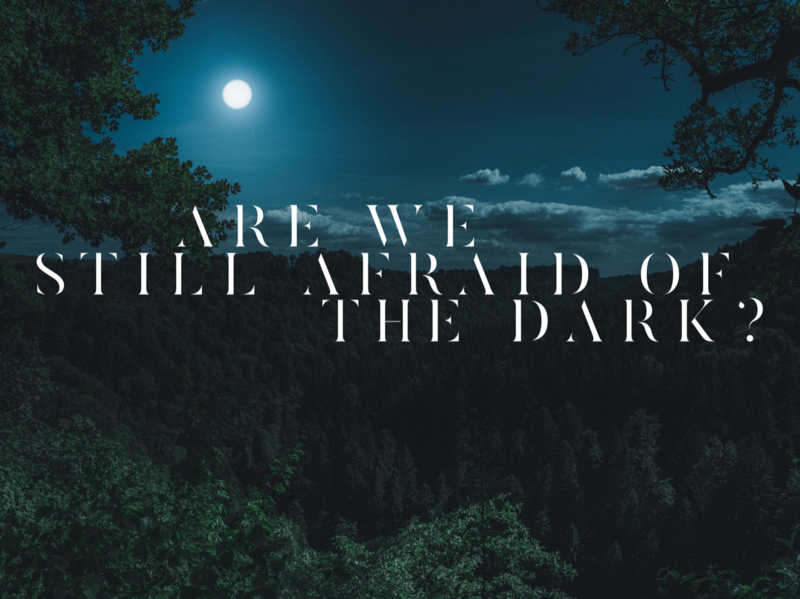 Home » Are we still AFRAID of the dark? Are we still afraid of the dark even as adults? When we’re kids it’s different. We’re afraid of things under our beds or things lurking in the shadows but as adults we’re still afraid of the dark only now it’s not a literal darkness but a mental one, an emotional dark. When I was in elementary school I had the opportunity to go to science camp. Remember science camp? So fun, cold, dirty, but mostly fun, right? All week we’d go on hikes and we’d look for banana slugs and deciduous trees and as we hiked they’d tell us about the night hike that was the climax of our stay at camp. It was going to be on the last night and they’d send us off ALONE, individually, by ourselves to do this night hike. And lemme just tell ya, the thought of hiking ALONE in the DARK, in the WOODS stressed me out all week long. I was absolutely afraid of the pitch black darkness we experienced there, and of possible bears, and creepy monsters (even though I really did know they didn’t exist) or whatever else hides out behind the trees in the forest at night. Eventually Friday did come and the moment I’d been dreading all week was upon me. We all gathered together and they lined us all up for this night hike. They’d send us off one by one every 5-7 minutes so you were alone enough (unless you stopped walking entirely – didn’t think of that then!). It was incredibly short really. It didn’t FEEL short at the time but I remember mustering up every ounce of courage I had within me because I was NOT going admit to my friends and all my classmates that I was afraid, even though you totally know everyone was feeling the same way at the time. As I walked I took deep, deep, deep breathes and through my tightly clenched teeth I’d tell myself over and over and over again that I could do this. The kids before me did it. No one screamed so the path must be clear of monsters or bears and the next thing I knew my hike was done. I saw the group up ahead all smiling big triumphant smiles that we had conquered our fear of the wilderness dark and survived. It was absolutely the highlight of science camp. I still remember it vividly today as an adult. I overcame my fears. I felt afraid and I did it anyway. 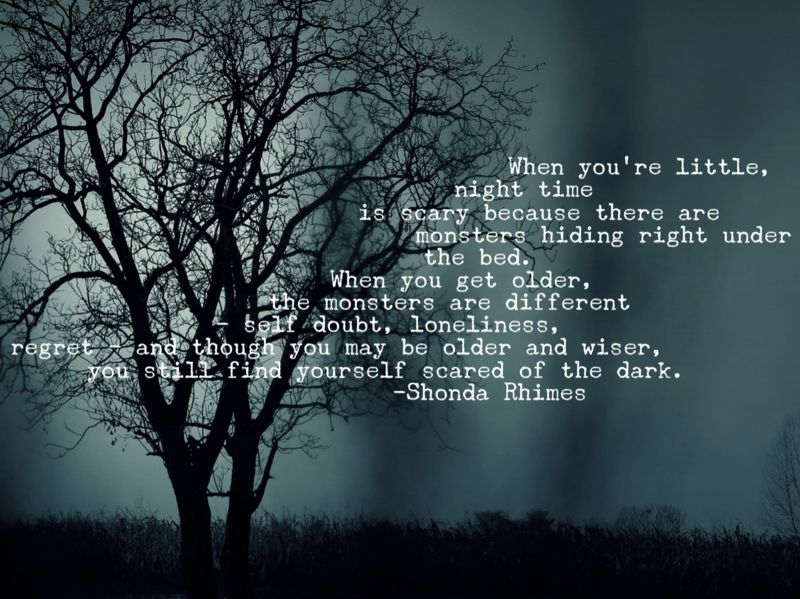 Self doubt, shame, loneliness, regret all like to hide. When you’re feeling any one of these it can feel very much like you are so alone. It can feel like it is so dark and it can feel so scary. She teaches that when we’re feeling this way we hide. But that’s the opposite of what we NEED to do. We need to connect with others. We need to SHARE our fears. The best way out of this darkness is just to take one step forward. It’s scary to share it too, I know. But I can tell you that when you do share it the person you’re sharing it with has felt it too. If you’re human, you’ve felt it and we can all lean on each other and support one another through these dark times. Let us lead each other forward and learn how to overcome ourselves. Like my science camp experience the best way to overcome our fears of the dark is just to start moving. 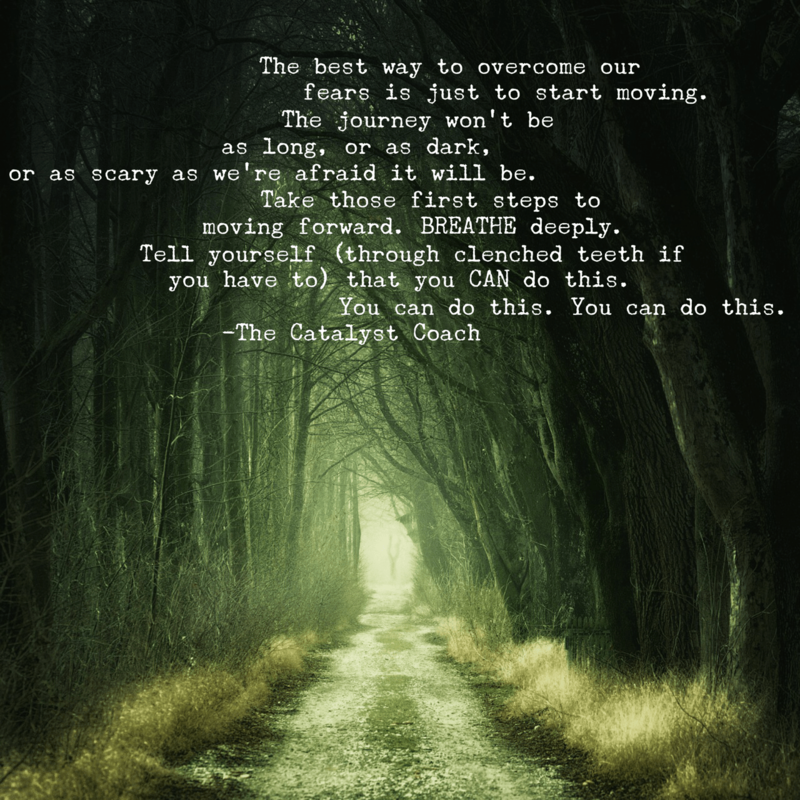 The journey won’t be as long, or as dark, or as scary as we’re afraid it will be. Take those first steps to moving forward. BREATHE deeply. Tell yourself through clenched teeth if you have to that you CAN do this. You can do this. You can do this. Get out of hiding. If you’re feeling shame, call someone. Write what you’re feeling down. Get it out of your head and get yourself out of the dark. Pretty soon you’ll find others that have survived through it too. You won’t be alone anymore. You’ll see your people at the end of the hike, smiling their triumphant smiles that they too, overcame their fear of the dark. Hey, did you hear about the new SELF-AWARENESS challenge I’m offering? Subscribe at the top of the page and get instant access to it! This won’t stay up forever…in fact, it’s going into the archives very soon so subscribe today so you don’t lose your opportunity to snag it!